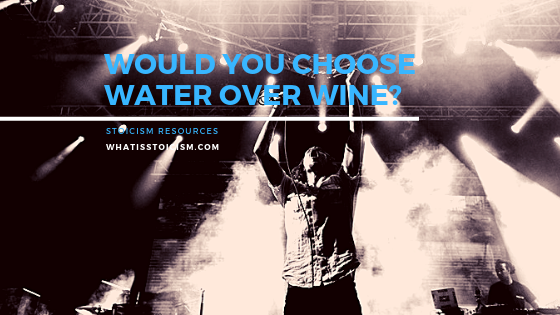 Would You Choose Water Over Wine? - What Is Stoicism? Recently I heard a song that I hadn’t listened to in years. I make the distinction between heard and listened because this time the song moved me in a way it never did before. It’s easy to listen to something without really processing it, it’s more difficult to hear it and thereby digest it. The song was Drive by Incubus, and it was first released in 1999, when I was probably too young to appreciate its depth. 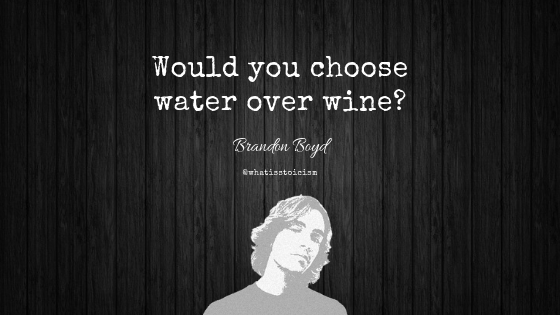 What I hear in singer Brandon Boyd’s lyrics now I instantly recognise as Stoicism. In the first verse and the pre-chorus, Boyd longs to take control of his life instead of letting fear dictate his actions. As Seneca said, “We are more often frightened than hurt; and we suffer more from imagination than from reality.” A certain amount of fear can be important for sensing impending danger, but often the things feared don’t come to pass. The chorus of Drive is classic Amor Fati – the love of fate. It defiantly says bring tomorrow on, regardless of what is has to offer. Whatever happens, I will accept it, even love it.